* What are ways you motivate yourself to do things that need to be done? Well in the case of schoolwork I tell my test scores to a select few of my friends. Some who will understand andd be my shoulder to cry on if it's a bad grade. And those who I wouldn't want to know if I got a bad grade. That way I have an equal amount of support and pressure. 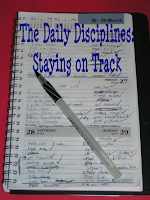 * Do you have a to-do list, or do you have another method to stay on track? Describe how your method works (it may give us ideas)! Also I have one of those marker board calendar/blank board things that hangs on my wall where I keep my schedule and notes to myself. * What helps you feel a sense of accomplishment at the end of each day? I have recently found your blog and have especially enjoyed reading your past 'daily disciplines' posts. I find that having accountability (as Purl mentioned) does help, as does setting rewards for myself for each task done (ie. reading a chapter of my current book! or checking/sending emails to friends). I find that a planner/diary does work well as a 'to-do list'. I sometimes give my list to another family member, and have them tick off each task as i do it, if I am in a especially procrastinative mood... :p.
"I also have a master school list, a printed table with a column for each subject..."
Anna, this sounds like what I am looking for. Did you make this yourself or did you find it somewhere online? Mrs. Hart: It's a very simple document that I made up. I actually started making them this way with Elijah's help back when I was 12 and took over my own home education planning. I'll email you with examples. I have to-do lists like crazy! I have a weekly cleaning schedule broken down into morning, afternoon, and evening with the afternoons schedules each day for deep cleaning a specific area. I also have a meal plan that I make every two weeks. I always know what is for lunch and dinner which helps me to make sure the cooking gets done and that we aren't always eating the same things. It also helps me to grocery shop without breaking the bank. I know what I need and that is all we get. I don't really have an accountability group or person. These are things I need to get done! I motivate myself by 1. not allowing TV or computer use until it's all done and 2. thinking of my wonderful husband. He sure doesn't want to come home from a long day at work to canned soup and a dirty house. He would never complain if I slacked, but I feel so much better about myself knowing he has a nice, warm meal and a clean house to live in.